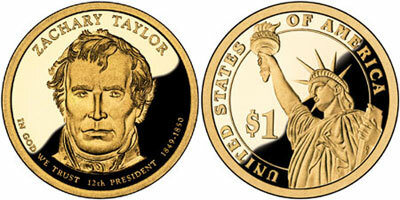 The Zachary Taylor Presidential Dollar is scheduled to be released on November 19, 2009. This will be the fourth and final Presidential Dollar coin of 2009. This will be the twelfth release of the series overall. Details of any official launch ceremony are yet to be revealed. The obverse of the coin was designed and sculpted by Don Everhart. It features a portrait of Zachary Taylor and the inscriptions “In God We Trust,” “Zachary Taylor,” “12th President,” and the years of his presidential term “1849-1850″. After controversy of prior years, the motto “In God We Trust” was moved to the obverse of the coin. The reverse of the coin carries the rendition of the Statue of Liberty which was also designed and sculpted by Don Everhart. This is used as the common reverse design for the entire series. The inscriptions read “United States of America” and the denomination “$1″. The coin has edge lettering which includes the motto “E Pluribus Unum” and the date and mint mark of the coin. Production figures for the Zachary Taylor Presidential Dollar are yet to be known.